Cirque Bijou create and produce bold, visually arresting, highly physical circus. Through collaboration with exceptional and diverse talent and the use of multiple art forms, we comment on and challenge contemporary culture, and inspire a sense of inclusion and shared meaningful experience in communities and across a broad audience. 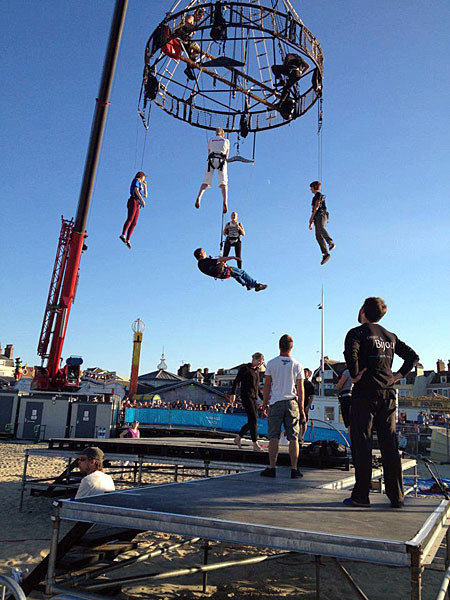 In 2013, Cirque Bijou in partnership with Diverse City set up a professional integrated circus company, Extraordinary Bodies. Cirque Bijou is passionate about working in an integrated and inclusive way and continues to learn how to best do this in the field of circus and outdoor arts. Cirque Bijou's talent development programme, Step Up, gives young people aged 16-25 support and skills to create new work for the outdoors by offering commissions, mentoring, business and marketing support, professional performance platforms and artistic mentorships.